We are each distinctive individuals with unique styles of writing. Our handwriting is a tangible extension of our inner selves. Have you ever wondered what your handwriting says about you? With a basic understanding of handwriting analysis you can discover more about yourself and those around you. 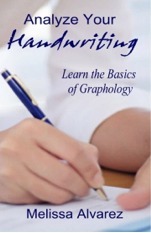 Graphology is the analysis of a handwriting sample. Graphologists can tell when someone is loyal, excitable or hiding something just from slight nuances in writing. Would you like to learn to do this too? Once you know the basics you will never look at handwriting in the same way again. With Analyze Your Handwriting, you can learn the fundamental skills necessary to determine if you will be compatible with another person, if someone is trustworthy and individual personality characteristics. It is an exciting, fun tool that you can use on a daily basis.